An avulsion fracture occurs when a tendon pulls off a piece of a bone, usually from a forceful collision. It is a common injury in sports, particularly in the thumb area. Without any other damage, these types of fractures heal rather simply and therapeutic exercises can help you regain your strength and range of motion. However, ligament damage can make the injury more complicated and take longer to heal. This type of injury can occur in an athletic contest, an auto accident or through a household fall. When an avulsion fracture of the thumb occurs, the first way to treat it is with ice to reduce swelling and rest. After X-rays, you can begin therapy for it right away as long as there are no tendons involved in the injury. If tendons are involved, surgery will likely be indicated. Your thumb will be in a special brace called a spica cast for about four to six weeks before you can start exercising. Squeezing a rubber ball will help you regain strength in your hand. Squeeze the ball 10 times, take a 30-second break and then squeeze it 10 more times. Do this every day for a week. 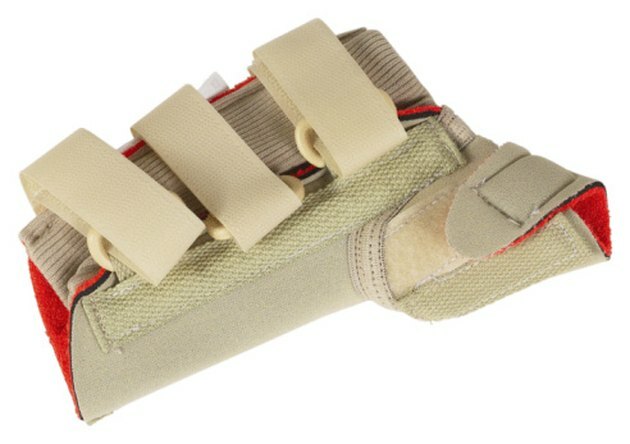 After suffering an avusion fracture of the thumb, you will want to regain range of motion and dexterity as quickly as possible. You can do this with the "hitchhiking" exercise. Touch your thumb to each of your fingers. Start with the forefinger and then move to the outside. After you touch all four fingers, stick your thumb out as you make a fist as if you were hitchhiking. Do this 10 times, take a 30-second break and repeat the set. Since your thumb has been out of commission as a result of the avulsion fracture for at least four weeks, your arm and wrist has not been able to do much either. You have to strengthen both of those areas as well if you are going to fully recover. Do wrist stretches to strengthen your arms and wrists. Place your arms on a table and keep your elbows straight. Move your body over your hands until you feel your muscles stretching, then relax. Do this 10 times, take a 30-second break and repeat the stretch. After you begin exercising, you thumb will most likely be pain free and you may think that you have healed. However, do not try any heavy lifting or driving for at least six weeks after the spica cast has been removed. Your thumb will likely be quite weak even though you won't feel pain. By overburdening your thumb prior to full healing, you could suffer an additional injury.